The terms “North Country” and “world premiere” haven’t mingled very often, but May 8, 1953 was one notable exception. It all had to do with Fort Ti, but not the one we’re all familiar with. This was Fort Ti, the movie, and it was special for several reasons. Since the earliest days of movie-making, film crews have used dozens of locations across the region, but this particular movie had a significant impact both locally and nationally. The fact that Ticonderoga in Essex County, New York, hosted a world premiere is itself impressive. It carries added importance that the historic State Theatre hosted the event. Ticonderoga’s Union Opera House had been a center of culture in the village for more than two decades, but when it burned in 1916, it was replaced with a theatre, The Playhouse. Culturally, the town didn’t miss a beat: The Playhouse hosted violinists, pianists, lecturers, movies, bands, vaudeville shows, magicians, and myriad other performers for the next twenty years. In 1937, owner Alfred Barton leased the building to a company that owned 140 theaters in the northeast. An intense remodeling ensued, and the changes were dramatic: a new domed ceiling- new lighting- drapes and curtains added to the stage- new plush carpeting- air conditioning- a large marquee sign- capacity expanded to 800- and newly upholstered and roomy seating, staggered for easy viewing from any location. A month later, the building reopened as the State Theatre, receiving glowing reviews from all, and calling to mind one word: magnificent. A variety of events were held there, but it was primarily a movie theater, and when the time came to select a site for the premiere of Fort Ti, the State Theater was the obvious choice. This wasn’t just any movie. Though most modern reviewers still give it two stars out of four, Fort Ti was important for another reason. Television was a new and growing medium, and its effects were felt throughout the movie industry. People were staying home evenings to watch TV, and something new was needed to bring viewers back to the theaters. 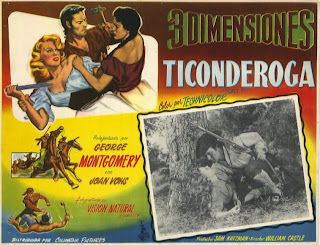 In the 1950s, 3-D movies were the solution. Fox, MGM, Paramount, and Warner Brothers all rushed to produce movies in 3-D format. Columbia employed the Natural Vision System, the same technology used by a few of its competitors. Fort Ti was to be Columbia’s showcase offering, and movie attendees had to wear polarized glasses to enjoy the intended effect. One lens was red and the other blue, and in general, the idea was to merge two visual impressions into one. The result? Objects looked like they were jumping out from the screen, right at the viewer. The launch at the State Theater was accompanied by a pageant portraying events surrounding the capture of Fort Ticonderoga by Ethan Allen on May 10, 1775. The premiere date of May 8 was chosen for its proximity to that anniversary. Media from the entertainment world were on hand, including representatives from magazines, newspaper, and radio (what, no TV?). After all the hype, it was time to watch the movie. Was all this 3-D stuff for real? Fort Ti producer Sam Katzman and director William Castle certainly thought so. In an unusual move, Columbia had employed Katzman for the project, a man who LIFE magazine called “the only independent producer whose films—though all despised by critics—have never lost money.” It didn’t matter much that he was often known as a “schlock” producer. For forty years, he made money for the studios, and that was what counted. 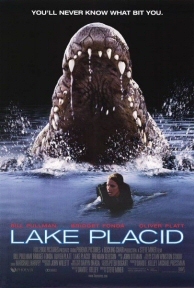 The movie is only rated average, but “unrated” components conferred cult status upon it. Though Ticonderoga is nearly on the East Coast, Fort Ti is generally categorized as a Western. Some movie historians include it on their lists of the most important Western films of all time, not for the story, but for the new 3-D format and the effect it had on viewers. For the record, the film included many Hollywood embellishments, and dealt with a story of Rogers Rangers, Jeffrey Amherst, and several other players, with a romance built in, and plenty of fighting action (offering ample opportunities for throwing things at the audience). George Montgomery played the leading role as Captain Jed Horn, while young Joan Vohs (a former Rockette) played his love interest, Fortune Mallory. One other participant was Ben Astar, said to be one of Israel’s top actors, and fluent in twelve languages. Was Fort Ti the best 3-D movie ever made? Hard to say. Was Fort Ti the best movie ever made in Ticonderoga? Not even close. But that’s a story for another day. Photos: Fort Ti movie poster- a sample dual-image clip used to create the 3-D effect in Fort Ti.